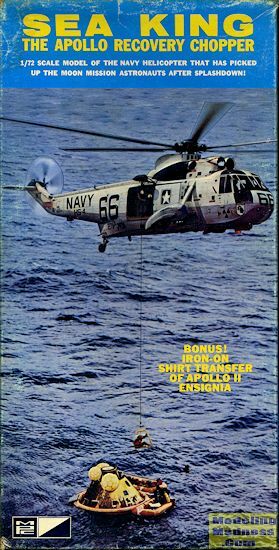 Introduced in 1961, it served in the United States Navy as a key ASW and utility asset for several decades before being replaced by the non-amphibious Sikorsky SH-60 Seahawk in the 1990s. The type also proved popular in civil service and with foreign military customers. As of 2015, many remain in service in nations around the world. The Sea King has been built under license by Agusta in Italy, Mitsubishi in Japan, and by Westland in the United Kingdom as the Westland Sea King. The major civil versions are the S-61L and S-61N. This kit was bought on a fire sale....literally. One end of the box was burned and while 99% of the parts are just fine, the main c anopy is pretty badly heat warped. No way to fix that other than a replacement so I'll use this opportunity to see if any readers have a spare (it doesn't have to be from an Airfix kit). While I have written to Airfix, no guarantee they will come through. Anyway, this is the MPC boxing and it has to be pretty old as it has a list price of $1.50 printed on the box. This is 'Old 66' which was used in the recovery of a number of spacecraft during the early days of space travel, including the moon landings. 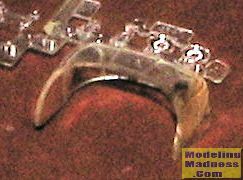 It is molded in white plastic with the usual rivets and raised lines of the day. The cockpit is fairly well appinted with a pair of seat shapes and both cyclic and collective controls along with an instrument panel. One is to cut out the instruments from the instruction sheet and glue them on. Two pilot figures are provided. The kit has a separate tail section with the proper short stabilizer and five blade tail rotor. Despite being separate, it is not designed to be folded over. The main rotor hub is fairly well done, but nothing to sneeze at, as they say. Though not required, the kit does include a dipping sonar and one is supposed to attach a string from it to the rotor shaft, thereby allowing the modeler to raise and lower the sonar. The cabin is void of anything other than a tube which houses the sonar and a forward bulkhead. All the windows fit from the inside save the main cockpit clear section. The main cabin door is designed to be able to be opened or closed. Sponsons are in two halves with various struts attaching them to the fuselae. There is no gear well and the rather basic looking gear can only be modeled in the lowered position, though an adventurous modeler can do a bit of cutting for the gear up position. There are attachment points provided to allow it to carry four torpedoes. 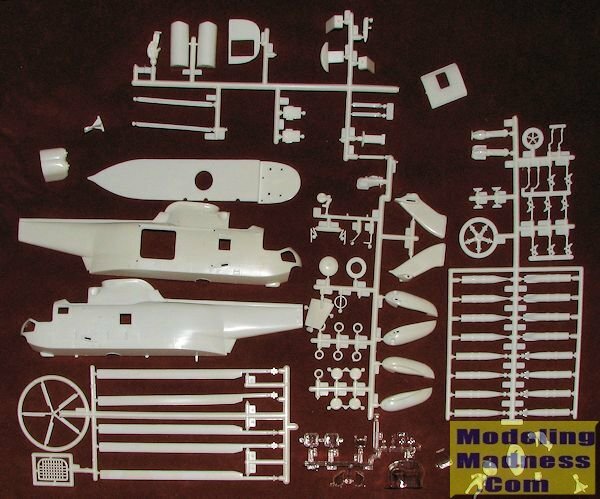 This kit also includes a winch above the cabin door and a net is provided to allow the modele r to place an astronaut into it, though it shows the net glued to the door sill. Note that when rescuing astronauts, it would not carry weapons. Instructions are fairly well done providing generic color information (white, grey, red, etc.). 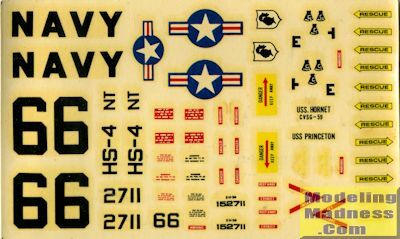 The decals themselves are beyond salvage, and will undoubtedly crack into fragments when put into water, if they come off the backing paper at all. Fortunately, Starfighter Decals provides an excellent sheet for this exact helo and their markings are vastly superior to any sheet from the dark ages. Though perhaps not this exact variant, Airfix still has several of the Westland Sea King kits in production. Even a venerable old kit like this is not beyond being worth building. I built the later MPC boxing many decades back and found it to be an enjoyable build with few real issues.